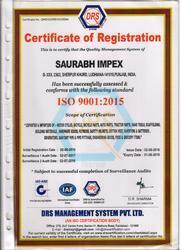 Established in the year 2002, at Ludhiana (Punjab, India), we “Saurabh Impex”, an ISO 9001:2015 Certified Co. are known as a notable Manufacturer, Exporter and Supplier of Metal Bolts, Metal Nuts, Special Fasteners, Metal Screws, Metal Washers, Thread Rod Bars, Bicycle Wheel Parts, Mudguard And Forks, Saddle And Parts, BB Axle And Parts, Side Stand And Supports, Chain Wheels, Brake Shoes, etc. Offered products are manufactured by our adept professionals using premium quality material and progressive technology in sync with the international quality norms. Our offered spare parts are highly demanded in the market, owing to their optimum strength, strong structure, accurate dimensions, elevated durability, rust resistance and abrasion resistance. In order to maximize client satisfaction, we offer these high quality products in diverse sizes, grades and other allied specifications. Our professionals are also able to customize these products as per the specific need of the client. 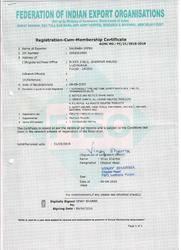 Under the guidance of these professionals, we have been growing rapidly in the market. Being a quality oriented company, we lay special emphasis on quality of products. The entire array is manufactured at our well-established manufacturing unit. Further, this infrastructural unit is well installed with modern technology and tools that helps us in meeting the broad and urgent orders of clients within the stipulated time frame. This unit is divided into numerous sub-units for hassle free business operation. Our skilled professionals work in close coordination with clients to bestow their specific needs. Due to our ethical business policies, client-centric approach, customization facility, experienced workforce, quality enriched products, simple ordering process, prompt delivery, competitive prices and vast distribution network, we have acquired a long list of clients across the market. Further, our focal point on variety, cost competency, quality and timely order processing has carved a remarkable position for us in the industry.We are exporting our product in these country US, UK, Spain, Dubai, Qatar, Kuwait, East and West African country. Saurabh Impex mission is to combine the best in with specialized inventing capabilities of new products and increase valuable experience in Importing & Exporting items to offer to their clients Complete Product Solutions at very Competitive Prices. Fostered with a highly knowledgeable and passionate team of professionals, we have been able to offer the optimum quality products. They are recruited on the basis of their knowledge and experience. Our hired professionals have rich experience and in-depth knowledge of their relevant field. In order to move with the ever-changing market needs, we conduct a number of training sessions, seminars and workshops for our professionals on a regular basis that help our professionals to be updated with all modern technology. Having an intense base of network in every nook and corner of the India & Foreign enables us to maintain the demand and supply chain efficiently. It helps us to procure high quality raw materials and assists in the distribution of finished products in the market. Also, with the help of widespread networking, we have connected ourselves with the most reputed clients of Indian & International market. We are renowned as an eminent firm of high quality products. Some of the key factors that placed us in the market ahead of other names are given below. Sprawling over a large area, the state of the art infrastructure is the most credited feature of our organization. It houses our proficient team and accommodates technically advanced machinery. Moreover, our infrastructure assists in proper Storage of goods in bulk quantities that too within stipulated time frame. As an ISO 9001 certified company, we ensure that we deliver world class and defect-free products to our clients at affordable prices. Our quality policy at every stage of production has helped us to offer to our clients the best quality products. We never compromise with the quality standards. Our quality managers keep a strict eye on the production process from the procuring of raw material to the finished product. Owing to their high quality and durability, these products are greatly praised in the market.